High dynamic range (HDR) photography is great because it helps you capture more detail in high-contrast scenes than you could with one photo. Why settle? 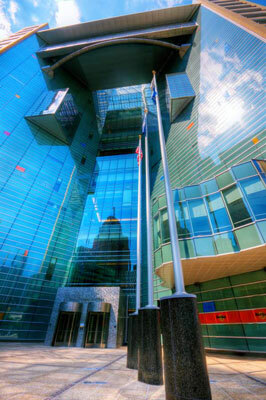 This is an example of an HDR image of a building in downtown Detroit. The sky and clouds were bright and the light was pretty harsh. Not only that, it was oppressively hot. HDR allowed the camera to capture the range of natural contrast in this scene, from the dark granite to the bright reflections. Photographing buildings, especially from this distance, often requires the widest-angle lens you have. Settings: f/7.1, 1/80 second, ISO 100, 10mm focal length. APS-C. This shot in feels more like a landscape due to the reflections in the mirrored glass. The lens caused the vignetting (darkened edges), as well as the softness. The contrast and colors are very nice, however. This scene, like a landscape, benefits from the light you see in the reflection. Notice the shadows cast by the trees? That’s right, it’s towards the evening golden hour. Had this scene been shot at a different time or with an overcast sky, it wouldn’t have the same effect. Settings: f/8 (listed; actual is less), 1/25 second, ISO 400, 60mm focal length. APS-C. 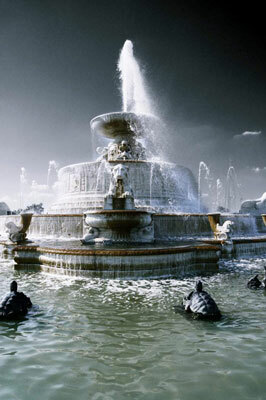 The fountain is located on Belle Isle, just outside of Detroit. In this shot, the sun is positioned to the left. It’s hitting the water and fountain from behind and to the side. The camera was held vertically to block out some of the distractions. This shot has been processed a number of ways. Instead of leaving it natural-looking (a typical blue sky with elements of green), the image has been desaturated (lowered the color intensity) and a dab of silver added. The result is artistic and unique. You know, you can do whatever you want with your photos too! Settings: f/11, 1/200 second, ISO 100, 18mm focal length. APS-C. 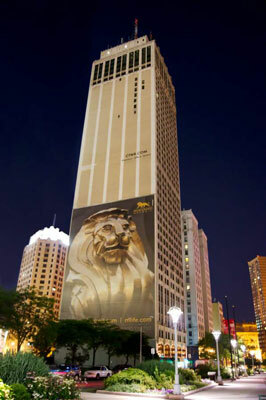 This is a photo of the Cadillac Tower in downtown Detroit. If you don’t have tall buildings where you live, travel somewhere else to photograph them. The wide-angle lens captures it fully. The dark sky (it was night) makes the building stand out nicely. Of course, shots like this need to be taken vertically. The building is leaning away, which is a tell-tale sign that the camera was pointed up to take the shot. If this bothers you, you can remove vertical distortion in software afterwards. When you’re in any city taking photos, pay attention to your surroundings. Watch out for traffic and other pedestrians. You increase your safety by keeping to well-lit areas that are frequented by visitors or tourists. It also helps to be with people. Settings: f/3.5, 1/4 second, ISO 1600, 18mm focal length. APS-C.
Look out from the arch. 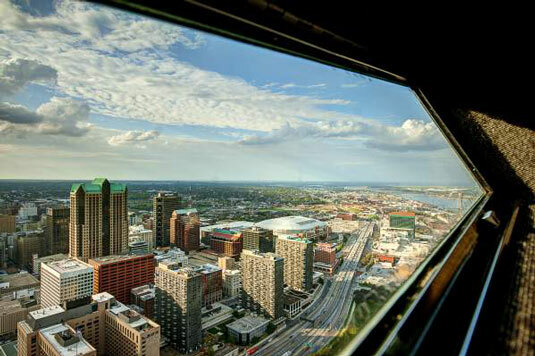 This shot was taken from the top of the Gateway Arch in St. Louis a number of times on road trips. The shot was timed perfectly to coincide with the evening golden hour. The perspective is looking out of the Arch to the northwest. The sun cast beautiful rays and the colors of the buildings really stand out. 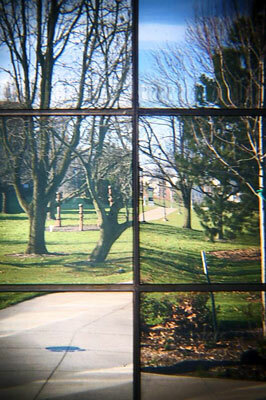 The camera was equipped with a wide-angle lens to capture this, because it includes part of the window in addition to the outside scenery. The aperture was set for a good depth of field and left the ISO at 100. The shutter speed was a reasonable 1/100 second. This shot shows the power of a unique scene taken from an interesting vantage point in good lighting. Settings: f/8, 1/100 second, ISO 100, 14mm focal length. APS-C.